Today, when somebody says “Video Games” people think of Disc-based formats, steam, or another distribution service; they might also think about violence and other ‘inappropriate’ material. Anyway, There used to be a time where Gaming was far less mainstream, and in many ways considered to be something of a toy use for technology. Generally, the way they were designed was to be as simplistic as possible; the entire thing was very simple to connect to a television, and switching games was as easy as removing the game and inserting another. Most early game consoles were cartridge based systems. Home Computers also experimented with the idea of Game cartridges, but eventually the lower price of things such as Floppy disks and cassette tapes for those systems made the cartridges obsolete. For consoles, which are in many ways simply a special-purpose home computer, the cartridge based format was around for ages. There is something of a special charm, to them; they aren’t just software, and they aren’t just hardware. In many ways they were a very flexible method, particularly in those days. Many games on various systems that used the cartridge based format employed special chips to add new effects that you wouldn’t otherwise see. Without the ability to essentially change the available hardware, the games wouldn’t be able to do this. Another advantage, is that cartridge-based games are a powerful demotivator for piracy; the games, as well as the hardware has to be fully understood before one could properly attempt to make a “copy” of a game; and the fact that the game used hardware as well as software meant that a copy would often be equally expensive to produce as merely buying the game itself; not to mention that you would need an original copy to work with and examine anyway, making it a bit of a moot point. While you could, in those days, turn the actual ROM code in a game into data on a PC, the PCs and home computers of those days weren’t even close to being powerful enough to run the emulation software many old game aficionados take for granted, and those programs didn’t exist until such time as the hardware abilities of a general purpose PC were high enough to make their goals workable. 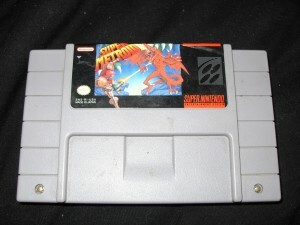 Of course cartridge-based formats have significant drawbacks, such as higher cost, more expensive to produce, the fact that, particularly with later titles, making the eye-dazzling effects that were expected of newer titles in the later days of a console required the use of expensive chips which had to exist in every cartridge, and also made things somewhat redundant, as multiple games used to the exact same chip. 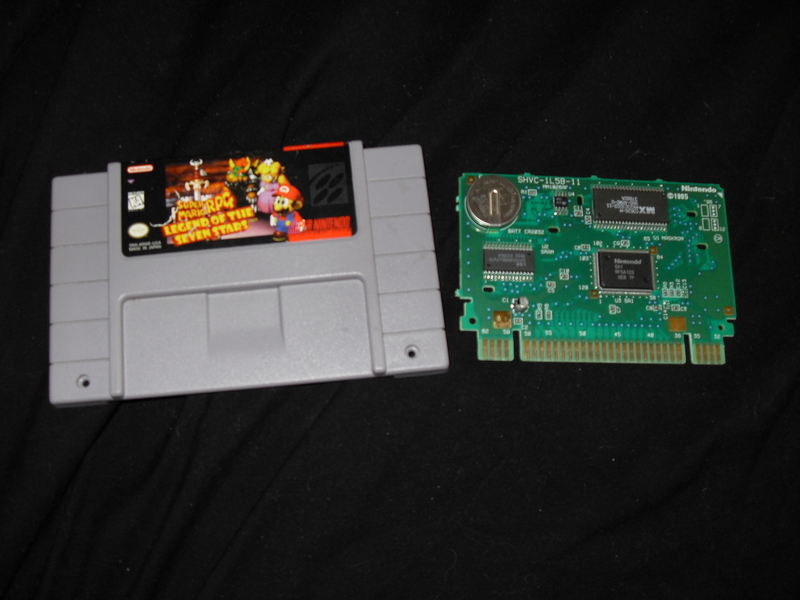 I only have a Super Nintendo console and cartridges (or “Game Paks” as the official literature states), so let’s take a look at some popular and rather common games, and their innards. 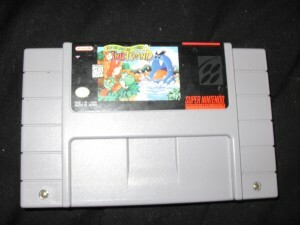 Who can forget this classic SNES title? 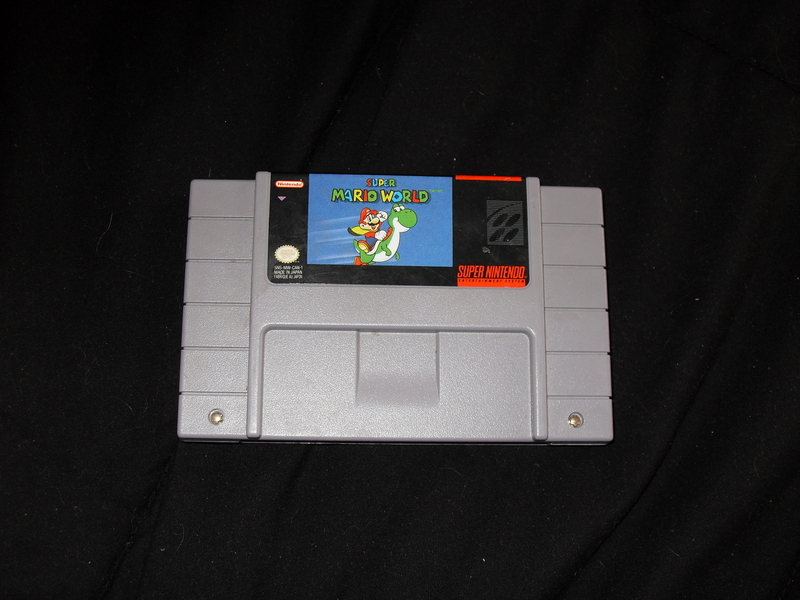 Super Mario World was the pack-in game sold with the majority of all SNES consoles. It was, in many ways, the “Super Mario Brothers” for the Super Nintendo. Additionally, it was rather innovative, except perhaps in story. Naturally, the story is the same “Save the princess” stuff; but the game itself is far more dynamic than, say, Super Mario Brothers 3; defeating levels would often change the surrounding terrain (in purely aesthetic ways) and defeating a level would clear a path to the next one. The most interesting new feature was the introduction of entire areas that were secret and required you to find keys and their respective keyholes to access. I personally feel it makes more “sense” than it’s predecessor (SMB3), if sense is something you can really apply to a game franchise that generally lends itself to cartoony characters, art styles, and mechanics. In any case, it tries to return to a more simple set of game mechanics. Super Mario Brothers 3 had several power ups: The Super Leaf, which turned you into a flying racoon, The ubiquitous Fire flower, A frog suit, a tanooki(mischievous bear being the best description) suit, and a Hammer Brother Suit. Naturally these all had their own unique abilities; additionally the game added an item system, whereby you could acquire powerups and use them on the map screen before entering a level. In that manner, Super Mario World simplified many of the more complex mechanics in it’s predecessor; for powerups you had the Super Mushroom, Fire flower, and Cape feather (flying with a cape making far more sense than being able to wiggle a raccoon tail and fly). The only item system was a single item box that you could deploy within any level, and could hold one item. It also automatically fell down when mario was damaged. Additional changes involved turning directly from a powered up Mario (Fire Mario or Cape Mario) into small mario; then you could try to get the powerup that fell as a result of the hit. Additionally, the game was in many ways longer (to complete in it’s entirety) than Super Mario Brothers 3, and the game featured three battery-backed save files. So, what made all this possible? Surely all this excitement and awesomeness means that that game pack is cram-packed with electronics to make it happen? Well look at Fig 2. and be disappointed if that was your expectation. It’s just a small board with four chips, and the battery to keep SRAM information alive. Note that to dissassemble these cartridges, there are a number of methods. I personally just use a Torx screwdriver set I purchased off ebay quite some time ago. In any case, the larger cartridge sort of hides the relative simplicity of it’s innards. 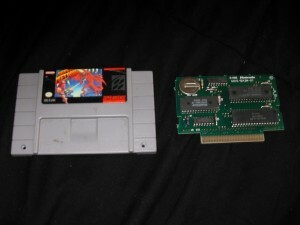 Another interesting point that could be made is that in the context of a SNES system, the game pak is sort of a “add-on” card; that is, it fits in a slot on the system board, and is interacted with. In the case of the SNES, (and NES and N64) these cartridges are necessary for proper operation; otherwise you are merely greeted with a blank screen. A good analogy might to consider the game paks as something of a “system BIOS” for the game, in that they are necessary for there to be any actual executable code within the system, and they are based on ROM chips. The primary reason for removing these “cards” from their cases would be for either investigative purposes (such as this posting) or for replacing or testing the battery. The battery is a basic CR2032 battery, the same one used in PCs for keeping track of clock and CMOS information, and much for the same purpose. They usually last a good number of years, but if your game is suddenly unable to save games or you find save corruption or issues, checking the battery is a good first step. One thing that many enthusiasts do with battery-backed save games is actually replace the battery holder with their own, that allows them to slip a battery in and out with ease. Most carts actually solder the battery on, and sometimes glue it. They weren’t designed to be user-servicable by any means (thus the special screws to open the system unit as well as game cases). 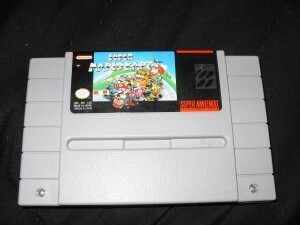 Super Mario Kart for the SNES is the first in a long line of Mario Kart games that employ the Mario Kart characters as the cast of a Go-kart race, and use a variety of cartoony obstacles and items based on the franchise, such as banana peels, koopa shells, Invincibility stars, Coins, and so forth, as well as featuring settings from the franchise for the tracks. This game is still extremely popular to this day, and competition for best times is still fierce. It became a “Million seller” and my first owned copy of the game was emblazoned with the “Player’s choice” logo. This copy that I purchased off ebay long after selling the original games and console are what some might call a “first run” of the game; I am unsure if there are software or hardware differences (such as bugfixes) between this and the Player’s Choice version. Nothing sticks out at me after playing the game, so I am willing to say that is not the case. 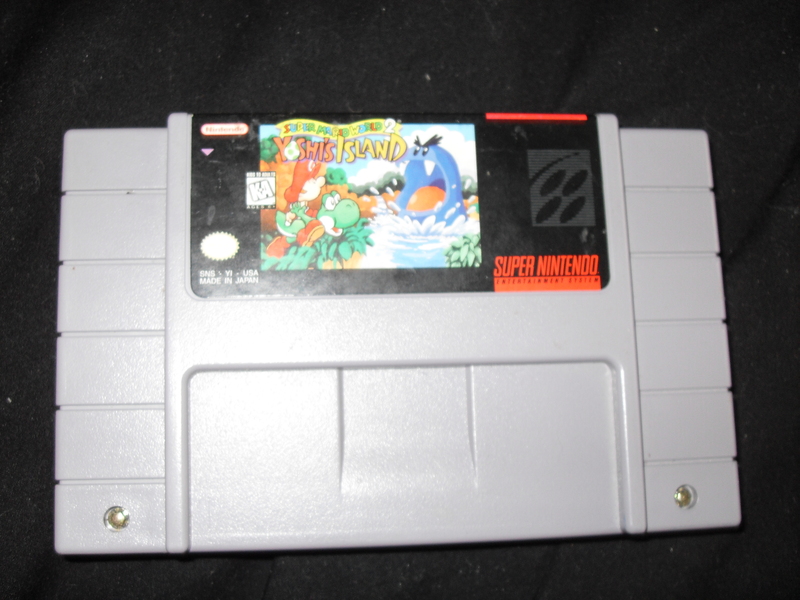 Something you may notice about this cartridge is that it seems to be designed differently from the Super Mario World cartridge. What makes this even more interesting is that it seems almost random what design a game will use. There are Super Mario World cartridges that use this “line” type design, and there are Super Mario Kart cartridges that use the smoother gradient design as seen on the Super Mario World cartridge above. I’m not really sure when, or why there is a difference. 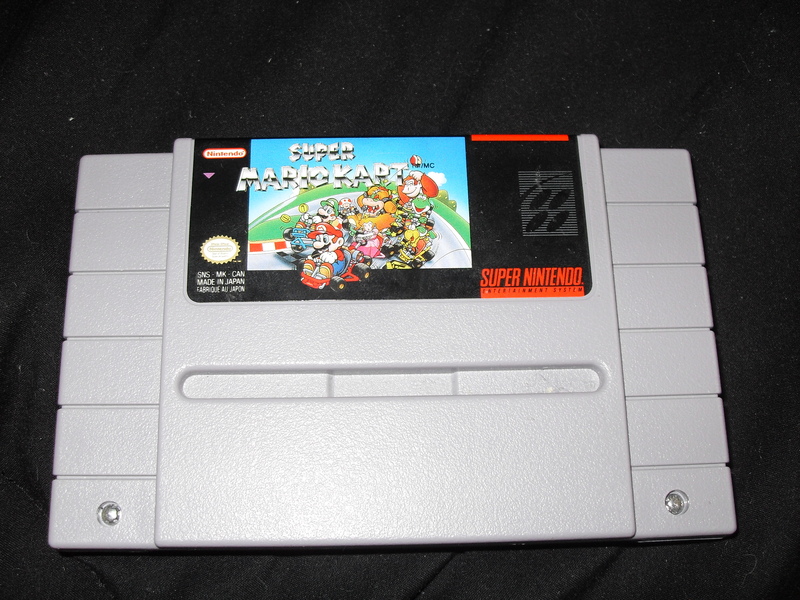 I initially suspected that maybe it was a cost issue; the cart for my previous Super Mario Kart was the recessed version, and it was newer than this one, so I suspected maybe it was a result of it using less plastic. But my Super Mario World cartridge uses the recessed variant. Also, I’ve seen all sorts of games that happen to use both designs, and I cannot find a consistent explanation, other than there maybe existing different factories that produced these that happened to use different moulds. Anyway, moving on to this games innards. 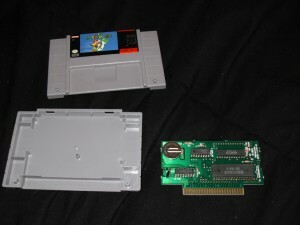 Taking apart this cartridge, (results of which are shown in Fig. 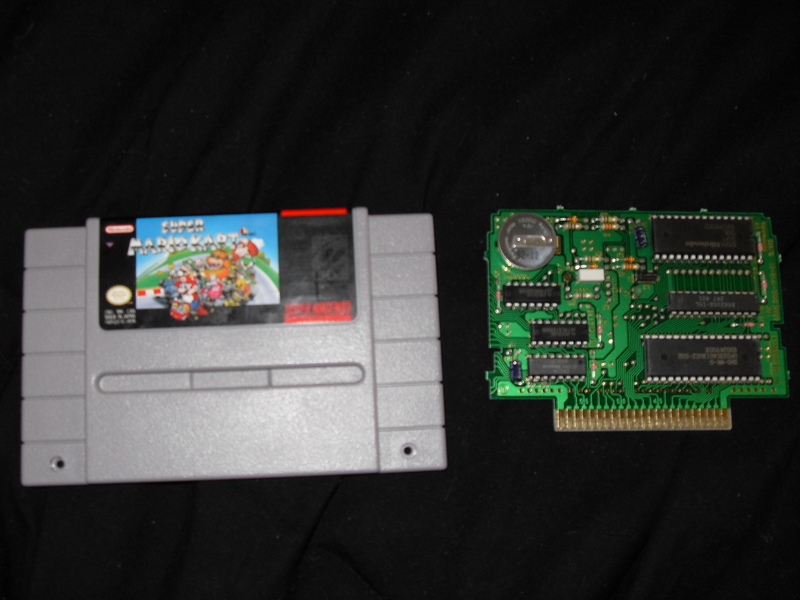 4) it is clear that the game uses a larger circuit board than Super Mario World. Of interesting note is that this game also uses a special chip, known as the “DSP-1” for advanced processing. It can be seen to the right, in the middle. This is used for the Mode 7 “split screen” that is used in the game both for single player and multiplayer. Mode 7 itself is a feature supported by the console, but the game requires a bit more horsepower to get it to work with the split screen model, thus the DSP-1 chip. The game also has Battery-backed memory for saving best times in Time Trials mode as well as what Cup’s/difficulties you have made the podium on and your place. The same sorts of information apply with regards to batteries as mentioned before. The board seems to have some sort of oscillator (not sure what that white thing is, to the right and down of the battery), which would make sense, the game does time you in hundredths of a second, so it might need that for more accurate timing. I presume I am wrong about this assumption though. Following in the footsteps of the wildly successful “Legend of Zelda” game released for the Nintendo Entertainment system, and abandoning many of the gameplay changes that were introduced in and shunned by many players in The second Installment for the NES, “Zelda II: Adventure of Link” This game returns to the “overhead” perspective used in the first game, and much like Super Mario World compares to it’s franchise counterparts on the NES, this game expands on the gameplay, graphics, items, and story of the original. Story is something that is pretty interesting, the original game basically through you into a world you were unfamiliar and had you figure out what you had to do. There is still a lot of that in this game, but now it is far easier to find and get hints about where secrets lie and where to go next. This is an improvement over the first game, because I can’t stand just wandering around a dangerous world hoping I stumble upon whatever it is I am supposed to be doing. The game features things such as upgrading your sword (first at a smithy, then by way of a fat faerie (don’t ask)); and upgrading your items either by purchasing the upgrade or using a number of other methods to get those upgrades for free. Dungeons, much like the first game, feature unique items that are often critical to progress further in the game world. The game is the first in the series to introduce the now franchise-ubiquitous “piece of heart”; basically, the game has hidden Heart pieces throughout the world; finding them will restore your HP, and for every four you increase your maximum life energy. In the previous game on the NES, you could find whole hearts in a few places, but the game didn’t have the heart piece system. Using a system whereby the hearts are found in pieces means the game has more discoverables, as well. And the much larger world basically requires that the world have plenty of discoverables and collectables to properly populate it with secrets. 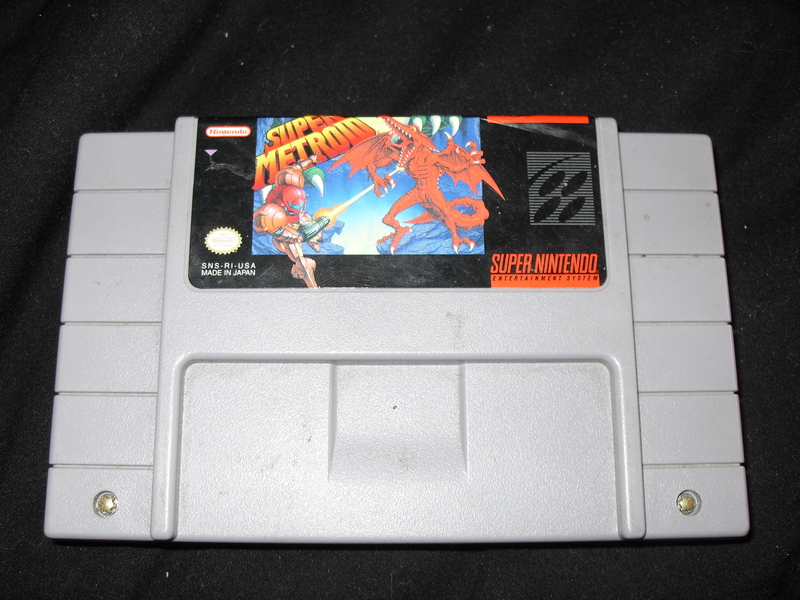 Arguably one of the best games available for the Super Nintendo system, Super Metroid, like Super Mario World and A Link to the past, essentially “extends” both the lore as well as the world and general mechanics of it’s franchise. In this case, it is the third game of the franchise; the first being ‘Metroid’ for the NES, and “Metroid II: Return of Samus” in which Samus, the main character, um… returns, I guess. I have no idea since I’ve not played that title. As you can see pictures in Fig 7, Nintendo is still playing their mind games with regard to the cartridge design. The game itself also has a Battery backed save feature, so we can expect a battery when we rip it open and see if it’s insides are still fresh. I believe this game was also re-released as a “Million seller” title, but I can’t be assed to google that at the moment. The Innards of the game are pretty much the same as all the other games. a few chips and a battery. Very little to get too excited about. 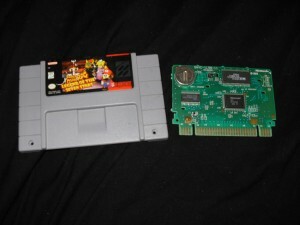 The game, being a launch title for the system, (or very close to one, anyway) doesn’t utilize any special chips as even first-party developers were still learning how to best take advantage of the relatively powerful capabilities of the SNES system itself. This game is something of a personal favourite of mine and has been for a number of years. It’s colourful presentation mixed with a bit of dark humour fridge logic (What happens to the monkeys when Yoshi swallows them?) is pretty epic. Of course it’s various advanced effects in the form of image scaling, rotation, lushly animated and coloured backgrounds and foregrounds, and so forth add to that experience. The title is sort of silly. Most people just call it Yoshi’s Island; the actual title is too long for casual conversation. And sort of redundant, and even silly. How is it Super Mario World 2: when you specifically control Yoshi for the duration of the game. Seems like a bit of spotlight hogging on Mario’s part to me. his primary roles in this game seem to consist of sitting on Yoshi’s back lethargically, and crying inside a bubble. The insides of this game prove to be the most interesting so far, however. Yoshi’s islands various high-quality image effects are made possible by the SFX2 chip that is built into the cartridge (the square one in the middle-right). 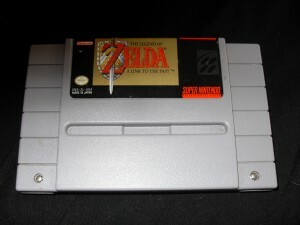 The cartridge also features two additional “tabs” which connect to slots in the console that weren’t usually used. Why? for moar power, obviously. The game also features the battery-backed save feature which of course means it has a battery. 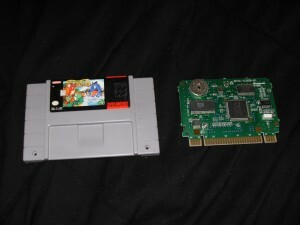 The SFX2 was one of the latest add-on chips used with the SNES, and as in fact the second version of the SFX chip, which was used with Starfox. In that regard it could be used for 3-D effects. Yoshi’s Island does indeed use a few of these 3-D effects for some platforms and objects, and it does so rather well. Capcom created a similar chip, the Cx4 chip, which has a more limited feature set and works exclusively with wireframes. This was used in Megaman X2 and Megaman X3 for various boss fights and whatnot. Here is another Wonderful game. 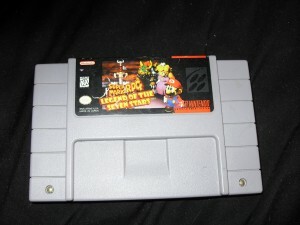 The best way to explain Super Mario RPG would be that it is the gameplay mechanics of Final Fantasy mixed with a Story, characters, and graphical style that fits into the Super Mario Universe (which incidentally is probably the name of the Mario game to be released on the next console, after all we’ve go Super Mario Land, Super Mario World, Super Mario Galaxy, it’s the next logical step) Anyway this game is the result of a joint effort between Squaresoft and Nintendo. The result is unique and has appeal to fans of both companies games. 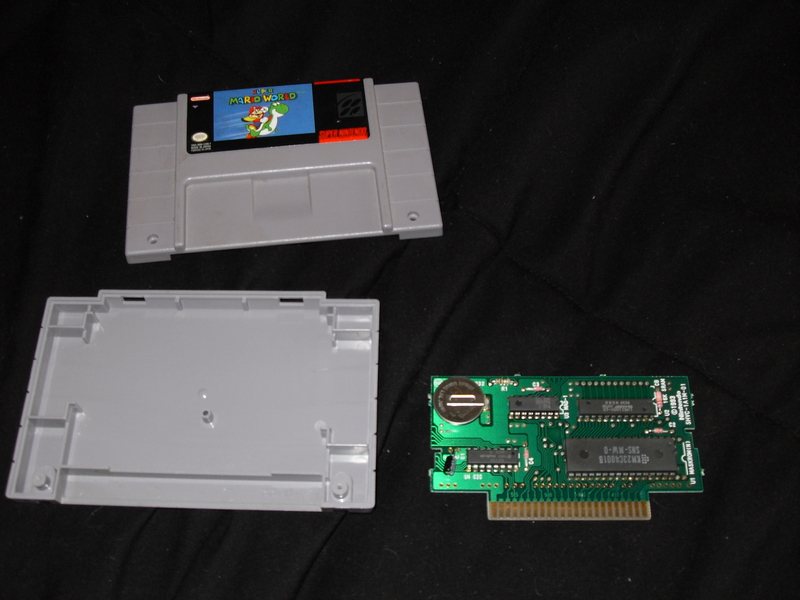 The Innards of the game are revealing; note that this game also uses the extra tabs in the cartridge slot. Some might guess “ah, so it has the SFX/SFX2 chip” Well, no. Many games with extra chips utilized the full cart connection. In this case, he game actually has the SA-1 chip, which can be best considered an “overdrive” chip, that speeds pretty much everything up. That isn’t a precise definition but that is the jist of it. We see once again the Battery, indicating a Save feature. And- that’s pretty much it. the SA-1 chip, a few ROM chips, and that’s it. What did we learn? well, possibly not a lot, possibly a lot, I don’t know. In any case, the Cartridge based format is fairly interesting, because it arose both as a result of market conditions as well as to curb the cost of installing things like disk drives and the like into various consoles; additionally, before that many games were “solid state”; for example, the Magnavox oddysey, which was basically two player-controlled squares that could be moved around the screen. You had to use your imagination to make it into a game. The entire machine was hard-wired. later machines were “programmable”, example being for example the Atari machine, which used what it called a “game cassette”; you had the system, and you chose a game by simply plonking your appropriate game cassette in it. This technology prevailed for many years. 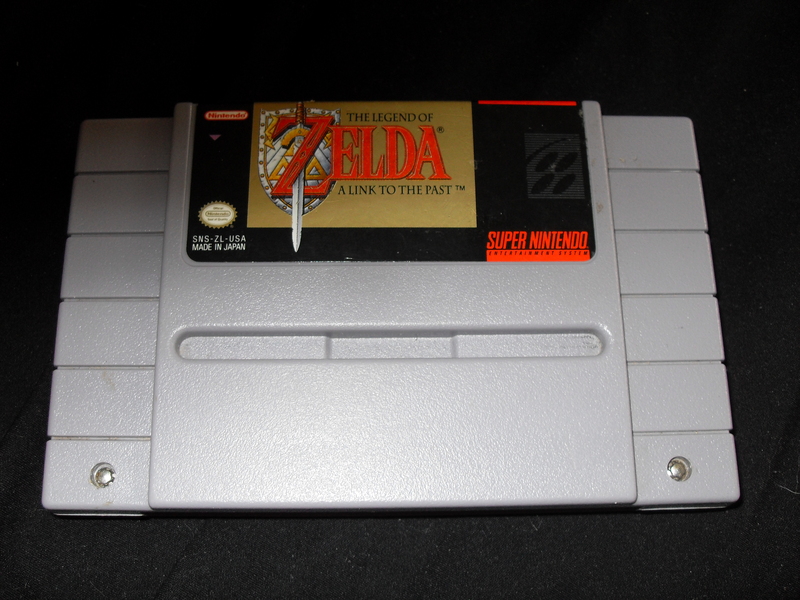 Nintendo in particular held fast to cartridges longer than many other companies. For a time, cartridges were really the only route to go; any other form generally meant magnetic media which meant mechanical drives in each system, which were prone to failure. This also presented the problem of making the games something that could be copied, which was rather rampant at the time and was something the game creators would have liked to avoid. Later, when Optical media was coming to the fore, it was a matter of trade-offs; the price for the optical media was far less than manufacturing cartridges, and it had a lot more storage space (whereas with a cartridge you would need to buy more ROM chips to hold more data). The Sony Playstation was the first console to really storm the market with it’s Optical drive; in those days CD-ROM drives were becoming something of an enigma and were the “cool and techno” type thing, so the Sony Playstation really reflected the pinnacle of entertainment systems at that time. 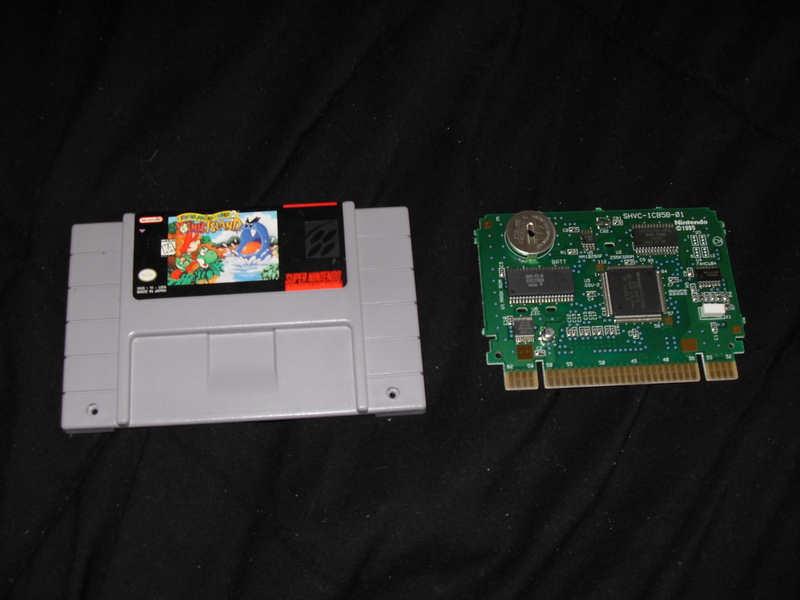 Additionally, it featured a 32-bit processor, which was faster than either the SNES or the Genesis/Megadrive. Sega responded by introducing first the Sega CD attachment for it’s Genesis/megadrive, than by releasing the Sega Saturn. These were both comparative flops. Nintendo made the surprising move of sticking with the cartridge based format for it’s new console, the “Ultra 64” which would be known as the Nintendo 64. This meant that the two systems (the playstation and the N64) had distinct disadvantages and advantages; the N64 had literally zero load time, but at the same time most of it’s textures were washed out; on the other hand, the Playstation lacked any sort of processing of it’s textures, but the N64’s extra processing power (in the form of the Graphics chip) was able to filter the otherwise low resolution textures, so you didn’t have low resolution textures all pixellated and stretched on a large object. If you pay attention, you’ll notice also that a lot of N64 games have the main character with very few textures; Mario in Mario 64 for example is predominantly solid-coloured and has no texture at all, merely vertex colours that are goraud shaded by the console. The playstation of course had it’s load time, but it also meant that games could be loaded on several discs; at the same time, because most code had to be loaded into the playstation’s memory before executing, this often meant less memory for the game itself, depending on how much it loaded. Nintendo finally accepted the Optical drive with the gamecube, but it made the disc spin the opposite way (to prevent piracy, or something I guess). Every system since has used Optical disks; moving from CD-ROMs in the playstation, to Blu-Ray DVDs in the case of the PS3… (I think). And now consoles even have hard drives! They are really almost the exact same as a specially designed PC.